Dice the sweet potato in cubes, sprinkle it with salt, pepper, cinnamon and rosemary and rub the spices together with the olive oil into the potato. Bake the potato for around 30 minutes in the oven. Place the lentils in a pot with 2 cups of water, bring to the boil and simmer for further 30 minutes or until the lentils become tender. Blend the dressing ingredients together. 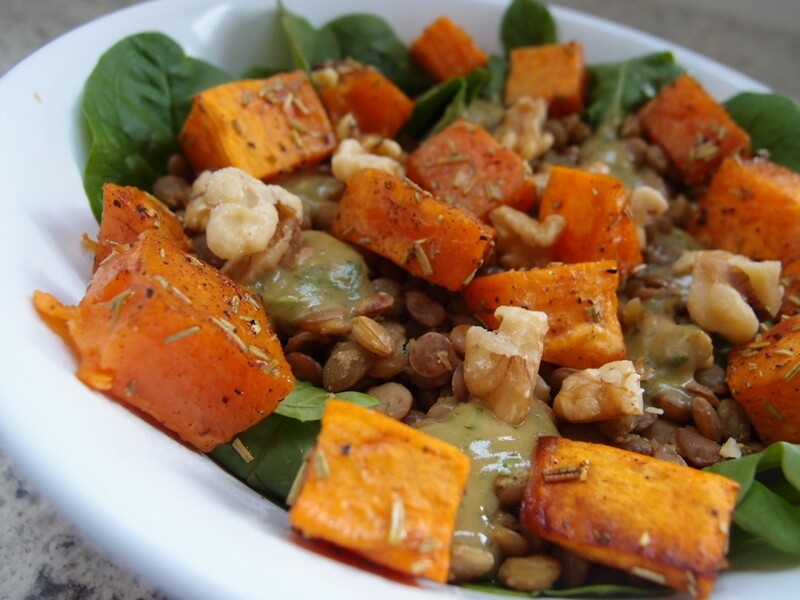 Place the baby leaves in two bowls , top them up with the cooked lentils and pour the dressing over the salad. 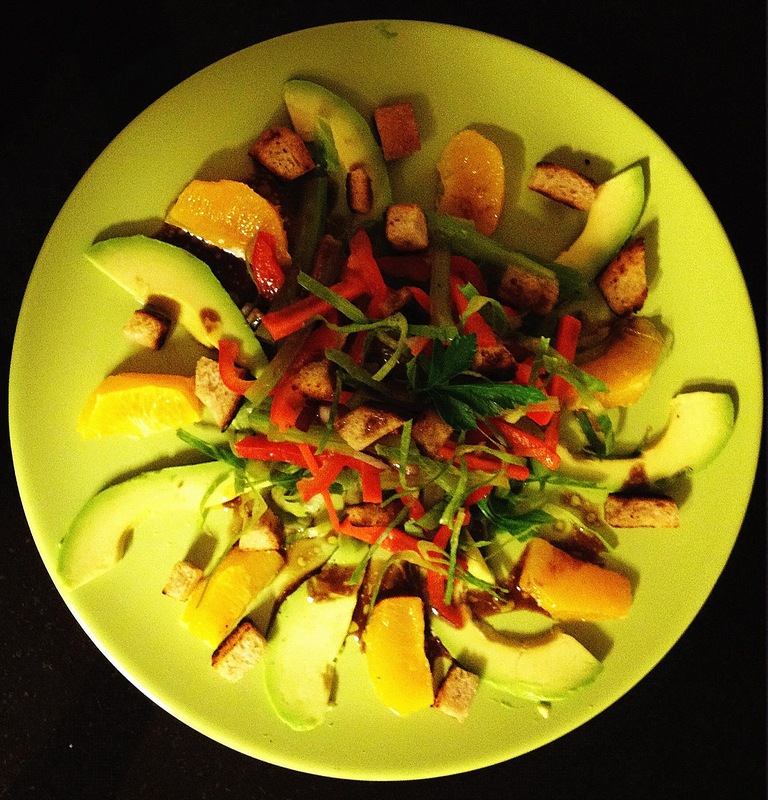 Arrange the roasted sweet potatoes cubes on top of the salad and enjoy! Shred the cabbage and place it into a salad bowl. Grate the carrot and finely chop the parsley. Blend the dressing ingredients until the smooth consistency is achieved. Pour the dressing over the cabbage, carrot and parsley and mix well. 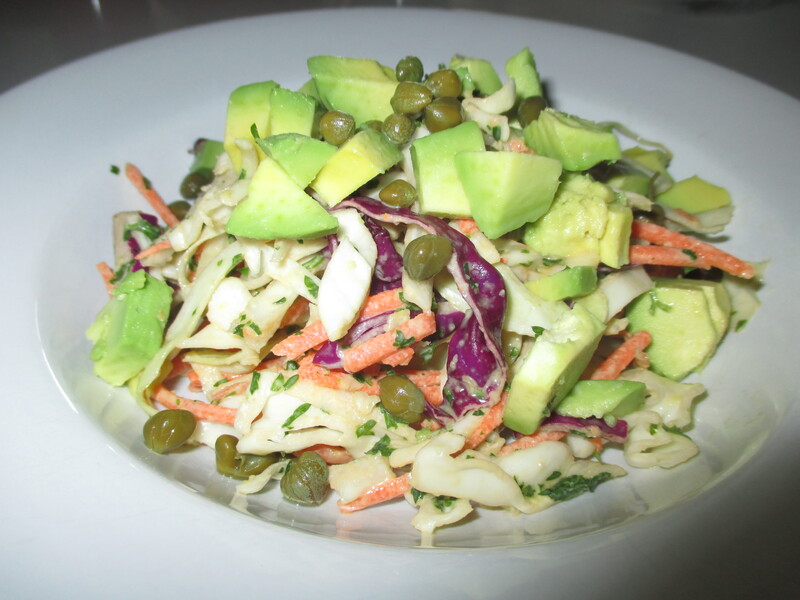 Top the salad with the sliced or cubed avocado and the capers, if using. To make croutons, preheat the oven to 400°F. Remove the crust (optional) and slice the bread in around 1-1.5cm cubes. Line a baking sheet on a baking tray, spray it with olive oil and arrange the bread cubes on it. Spray the bread cubes with olive oil, season with pepper and bake for about 15 minutes or until croutons turn golden-brown. To make dressing, place all ingredients in the blender and process until the mixture forms smooth dressing. ulienne capsicum and celery and blanch them. Slice off the skin from oranges and cut along the inside of the membranes separating orange segments. Slice down to the centre of orange desegmenting along its membranes until you are left with the membranes only. Squeeze juice out of the leftover orange carcass into a bowl to add to the dressing (optional). Cut avocado in thin slices. Arrange oranges and avocados on the plate, place sliced lettuce in the centre, top it with blanched capsicum and celery. Drizzle with dressing and leftover orange juice, garnish with parsley or your favourite herb, add the croutons and serve immediately.